...and will stand an hour in line for. 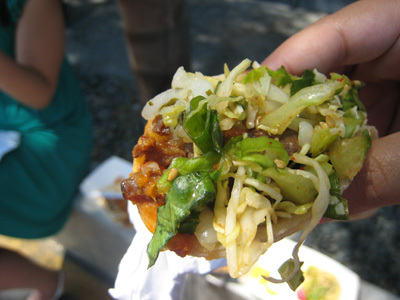 Recently, Dubya granted my birthday wish by chasing down the oh-so-popular Kogi BBQ Taco Truck with me one afternoon. Although I still consider myself to be young, I do manifest maturity in several ways: for example, I am extremely good at being the curmudgeon. I'd been interested in this Kogi phenomenon for a while now, but the idea of having to wait in line for food was extremely disagreeable, as anyone who has gone to dim sum with me can attest. In general, I refuse to eat anywhere that requires me to wait more than half an hour, let alone an hour (you know who you are, snooty French brunch place in Berkeley!). My time is precious, so your food had better be frickin' amazing if I'm going to have to wait for it. Especially if you're going to make me STAND the entire time. Another concern of mine when I try new places arises whenever food is "Asian-influenced." As someone of Asian descent, it can sometimes be hard to judge Asian-y foods without using authenticity as a criterion. But nowadays, I can deal with Asian-influenced food as long as it's advertised as such. If you try to pass off your Asian food as "authentic" when any Asian person can tell you that it's not, then that really annoys me. I could name a chain whose name starts with two initials and ends with the possessive of a Mandarin last name that rhymes with "fang," but I will not. Anyway, as it turned out, the wait wasn't that bad. It may have been the 90F plus heat, but for whatever reason, no one was waiting when we arrived, and so we got first place in line when the taco truck arrived. 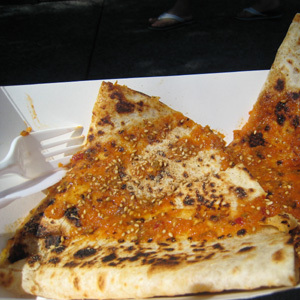 Dubya and I decided to try the kimchi quesadilla, the black jack quesadilla (one of the day's specials), the korean short rib taco, and the spicy pork taco. 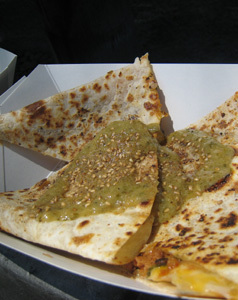 The black jack quesadilla was the bomb. I normally prefer kalbi over spicy pork any day, but their spicy pork was really delicious and flavorful, without the spiciness completely overpowering the meat. The salsas and whatever other crack they must sprinkle on this food totally took these dishes over the edge. So, to conclude, the food from the Kogi Taco Truck is extremely satisfying, and the culinary cultural combination results in truly delicious food. Delicious enough that I would definitely wait an hour to try it again. But no more. This old lady's got her limits. During month close while I was feeling particularly grouchy, Cut the Line! shared this site, which made me smile!